Sawmill Lakes in Ponte Vedra Beach, Florida. Sawmill Lakes is located in a residential community east of the Intracoastal Waterway in beautiful Ponte Vedra Beach. The community is 2.5 miles to public beach access and 1 mile to new Publix store. Sawmill Lakes is served by some of the finest public schools in the area. The community is just 20 minutes to Jacksonville downtown, the site of Super Bowl XXXIX, and just 20 minutes to the northeast of St. Augustine, the country's oldest city. Amenities include swimming pool, soccer fields, and outdoor recreation area for the benefit and enjoyment of the residents and guests. 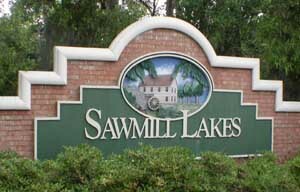 Sawmill Lakes has many home opportunities with resales available priced from mid $300's to over $700's.